After the Chicago Teachers Union House of Delegates meeting more than 100 union delegates gathered around the union's officers for a press conference to release the CTU's charge that the Chicago Board of Education was "Broke on Purpose." One of the many things not reported in the print media was the huge showing of union strength, as is seen above. Substance photo by George N. Schmidt.Overestimate future expenses; underestimate future revenues -- VOILA! You are projecting as big a "deficit" as you wish. By the middle of May 2015, the Chicago Board of Education and its apologists in most of Chicago's corporate media were still promoting the notion that Chicago Public Schools is broke. The response from the Chicago Teachers Union is that CPS is "Broke on Purpose." There is little doubt that this latest claim by CPS that it faces a "billion dollar deficit" (the sixth in six years) will be shown to be another Big Lie. The trouble is, the Board is able to make claims about its finances without providing the public with any actual budget numbers. At the earliest, CPS will present the public with a "Proposed Budget" in June (the fiscal year ends on June 30, 2015). But it already sounds like CPS will -- again -- claim that it can't present its budget until August, despite the fact that the budget is supposed to be presented to the public, with public hearings, prior to the end of the fiscal year. CHICAGO�The Chicago Board of Education (BOE) has rejected nearly every education - and student-based contract proposal offered by the Chicago Teachers Union (CTU), even when those recommendations had little to no costs associated with them. In addition, Mayor Rahm Emanuel�s hand-picked board is demanding the city�s public school teachers, paraprofessionals and clinicians agree to a whopping 7 percent pay reduction and sporadic increases in health insurance premiums. 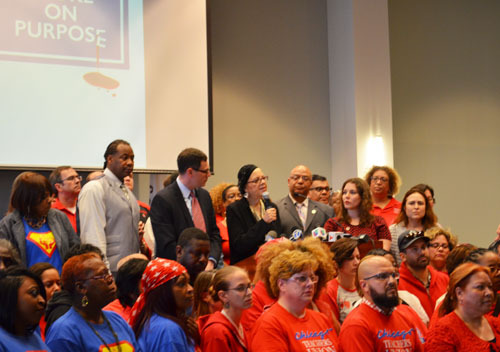 The CTU is insulted by the BOE�s demand and maintains the city of Chicago has created a $1.5 billion fiscal crisis in order to justify the ongoing neglect and its failure to address critical needs of students. Chicago Public Schools (CPS) is �broke on purpose� said CTU President Karen Lewis, and the mayor is �lying in wait� to raise property taxes and implement regressive taxes on vital services to working families. In the meantime, Mayor Emanuel refuses to explore revenue proposals that hold LaSalle Street and banks accountable for the $1.2 billion in toxic swap liabilities they have siphoned from the city. Instead of calling for more revenue by demanding the wealthy pay more in taxes, he seeks to saddle present and future generations of Chicagoans with even more debt. Flanked by the union's officers and more than 100 union delegates, CTU President Karen Lewis (above at microphone) announced that the union had filed an unfair labor practice complaint against the Board of Education. Substance photo by George N. Schmidt.CPS officials are negotiating the new labor agreement under the cloud of a federal investigation into a $20.5 million no-bid contract that appears to be expanding to other agreements. The district also plans to expand privately owned charter schools at taxpayer expense, spends $290 million annually on interest payments on debt and wastes $10 million annually on excessive high stakes testing. The BOE�s move to reduce teachers� take home pay appears retaliatory against the union in the face of the CTU�s work to weaken Emanuel�s stranglehold over the Chicago City Council, which resulted in the first runoff election in decades. In order to avoid pushing for necessary revenue before and during the mayor�s re-election campaign, CPS tanked its upcoming budget last year when they closed the FY15 budget by using 14 months of revenue and drawing down virtually all reserves. �Once again, the Board has created a fiscal crisis in order to justify its continued attack on our classrooms and communities. CPS is broke on purpose,� said President Lewis. �By citing its so-called $1.5 billion deficit, the mayor is proposing a reduction in teaching staff which will result in larger class sizes and the loss of teaching positions. The drop of CPS�s pension pick-up, established through a 1981 labor agreement, means that for the average teacher earning around $70,000 annually in base pay, the cut amounts to roughly $5,000 annually. For a newly starting teacher at $50,000 annually, the pay cut would be roughly $3,500. Across paraprofessional positions, the average salary is around $40,000 annually, and the cut is roughly $2,800. The 7 percent was included in the CTU contract 30 years ago in place of a raise the Board reportedly �couldn�t afford� back then. For the past decade, the BOE has spun a web of lies about the state of its fiscal health. While adding in its pension payments to its overall deficit press release claim, the city rarely cites the year-end surplus it sees at the close of each calendar year. It continues to break its own piggy bank, siphon off funds and cry broke when it�s time to provide crucial supports for its students. Chicago public school educators are trained professionals who use their expertise daily to better the lives of their students. They set high expectations for their students but recognize that their role is not always solely as an academic or instructional leader. Our educators strive to be role models for Chicago�s young people so that they are empowered and prepared for the next stages of their lives. �	To that end, the CTU will bargain to increase the professional autonomy of teachers and other educators to prepare relevant, engaging and appropriate lessons for students, to minimize redundant and unnecessary paperwork, and to assess student learning using grading practices that respect the students as learners. �	The CTU will bargain to ensure that educators and support personnel have the adequate preparation and planning time and professional development support to be able to engage students in rich, well-rounded, curriculum-based learning opportunities. �	The CTU will bargain to ensure that students are taught by trained professionals invested in a career in education by demanding that CPS end practices that privatize instructional positions as well as ending all contracts with Teach for America (TFA) and transfer any such investments from TFA to Grow Your Own, which prepares local people of color to be role models and teachers for our students in CPS. �	The CTU will bargain to support the efforts of our brothers and sisters in charter schools to be able to unionize without interference so that they can be protected as professionals and be the best possible advocates for the students they serve. Chicago public schools are vital facilities and each school must be intentionally designed and staffed to provide safe and educationally responsible environments in which students can learn. Dirty, hot, overcrowded and understaffed classrooms and learning settings are not what Chicago�s students deserve. As it stands, many CPS students do not have access to adequate housing or health care outside of school, so it is imperative that our schools are nurturing and healthy places to learn that are staffed to provide the highest possible quality of education for all students. �	To that end, the CTU will bargain to increase sanitation standards, improve cleaning and vermin control procedures and to ensure that all schools are completely air conditioned by the 2019-2020 school year. �	The CTU will bargain to significantly reduce class sizes and make a class size maximum enforceable for all grades, but particularly for students in the early childhood and elementary grades and in special education classroom settings. �	The CTU will also bargain to ensure that all schools are staffed with full time, fully licensed art, music and physical education teachers, to return the staffing of playground teachers and to guarantee that every school has a fully resourced and operational school library staffed by a full time, fully licensed school librarian. Extensive research continues to show that Chicago is a deeply segregated city where families living in different neighborhoods have significantly different assets and access to resources. Entrenched poverty, the erosion of stable, well-paying jobs and a lack of investment in many poor and working class neighborhoods, particularly Black and Latino neighborhoods, continue to cause students and their parents to experience vastly different life opportunities than Chicagoans living in more affluent communities. It will take investing in more than schools to address this inequity, but schools that are fully resourced can and should serve as anchors in each community in Chicago. �	To that end, the CTU will bargain for policies that strive to achieve increasing integration of student populations in schools and to invest significant and substantial resources into a least 50 sustainable community schools within CPS. �	The CTU will bargain to halt charter school proliferation, school closings and turnarounds and other school actions which destabilize communities and increase student mobility. 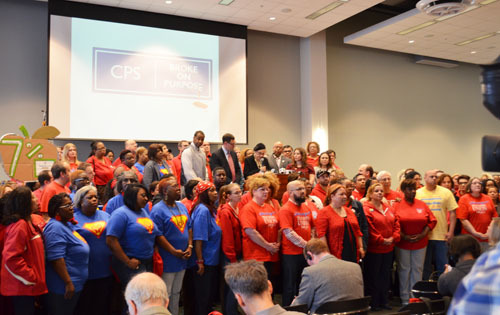 �	The CTU will bargain to ensure that all CPS employees and all employees subcontracting for CPS receive a living, minimum wage of at least $15 per hour for their work related to our schools. �	The CTU will bargain to provide all workers in the city and state with a defined benefit pension plan. All too often, the realities that Chicago�s students face are ignored and the only criteria used to ascertain whether students and schools are succeeding are test scores. Students in CPS come to school with immediate human needs that must first be addressed before they can be truly ready to learn. And when their immediate needs are met, the learning that students engage in should be meaningful, relevant to their lives and developmentally appropriate. In school, all children should be treated as dignified and creative learners whose presence, identity and experiences are valuable to the entire school community. �	To that end, the CTU will bargain to significantly reduce the amount of time each student must spend taking standardized tests to no more than 6 school hours per school year or restrict mandated standardized testing to only state required tests. The CTU will bargain to prohibit standardized testing for students in pre-K through 2nd grade entirely. The CTU will bargain for schools in the lowest quartile on standardized tests to receive additional resources, staff and supports to address the learning needs of the students. �	The CTU will bargain for true access to full day early childhood education and kindergarten including free pre-K for students whose family income is up to 300% of the Federal Poverty Guidelines or to families receiving AllKids (excluding premium level 2-8). �	The CTU will bargain to ensure that schools with the highest numbers of homeless students (or students in temporary living situations) have full time staff working to address their needs both inside and outside of the school. �	The CTU will bargain to mandate that school counselors and clinicians are staffed at levels that respect the recommendations of their professional organizations and that counselors in particular are not assigned additional duties (such as case management) that cause them to be unable to do actual counseling work with students. The CTU will bargain to guarantee that each school is staffed with a full time, fully licensed school nurse whose role is to address the health needs of all students. �	The CTU will bargain to staff a full time restorative justice coordinator for every school and to limit the ability of CPS to staff police officers in schools to ensure that student discipline policies do not contribute to the school-to-prison pipeline. The CTU will bargain to return staffing of truancy officers whose work centers around helping families remove barriers and solve problems that keep students from attending school. �	The CTU will bargain for students to have increased access to curriculum materials that are multi-cultural and multi-racial and reflect their identities and experiences. Educators who are members of the CTU have demonstrated through their words, actions and work that they are dedicated to fighting for real school equity and social justice for our students and their families; however, it will take the political will of more than just educators to achieve the schools and the city that Chicago�s students deserve. Board and city leaders must become true partners of the educators of the CTU in seeking policies and legislative actions that will resource our schools, increase democracy in their governance and address statutes that disproportionately target the already disadvantaged residents of the city. �	To that end, the CTU will bargain to partner with the Board to secure needed revenue for our schools by means of a tax on financial transactions, a progressive state income tax and the return of TIF funds. �	The CTU will bargain to ensure that the Board ends all current contracts and seeks no further contracts with financial institutions engaging in predatory financial deals such as toxic interest rate swaps, auction-rate securities, capital appreciation bonds, high-interest loans and bonds, bid rigging, manipulating interest rates, inadequate disclosure of risks, overuse of fees and overcharging for financial services. �	The CTU will bargain to partner with the Board to secure legislation that will establish an elected representative school board in Chicago and additional legislation that will repeal section 4.5 of the school code of the ILELRA in order to return the right of both parties to bargain on all subjects. �	The CTU will bargain to partner with the Board to secure legislation that will make at least six low-level non-violent felony crimes into misdemeanors and redistribute funds saved from the elimination of legal costs and costs related to incarceration to fund schools, drug rehabilitation centers and other community services.